Goettingen, Germany, April 20, 2018 / B3C newswire / -- Sartorius Stedim Biotech (SSB), a leading international supplier for the biopharmaceutical industry today announced the launch of a new mini bioreactor vessel for its ambr® 250 high throughput (ht) system. This new vessel, which is designed for optimal growth of adherent cells on microcarriers will enable rapid, scalable cell culture process development of vaccines. It will be shown on Booth 47 at the BPI European Summit (April 23-25, 2018) in Amsterdam, The Netherlands. The single-use mini bioreactor for microcarrier culture has a working volume of 100-250 mL and features a single Elephant Ear impeller. This impeller type generates optimum mixing and suspension of microcarriers, allowing adherent cells to grow over the entire microcarrier surface. The new mini vessel is based on cell culture bioreactors in the ambr 250 ht system. Utilizing this bioreactor on the ambr 250 ht system will allow rapid scale-up of optimized adherent cell culture processes to SSB’s BIOSTAT® STR range of pilot and manufacturing scale stirred bioreactors. This results in shorter process development timelines than would be achieved by scientists using benchtop bioreactors and spinner flasks. 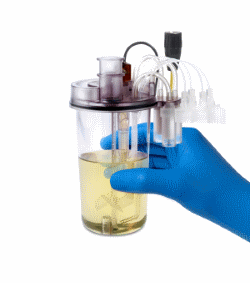 Simple to set up and use on the ambr 250 ht, this new single-use mini bioreactor minimizes set-up and turnaround time. With up to 24 bioreactors per ambr 250 ht system, the technology is ideal for Design of Experiments (DoE) studies to optimize process development for vaccine manufacturing using a Quality by Design (QbD) approach. The new vessel has been tested in collaboration with bioprocess experts at Aston University and University College London as part of an Innovate UK funded project. During these studies, all the cell culture parameters were controlled by the ambr 250 ht automated workstation. The results showed that the new microcarrier vessel design enabled growth to confluence of Vero cells on Cytodex microcarriers’ surface. Caption: New mini microcarrier bioreactor for ambr® high throughput system will enable cost-effective, scalable process development of vaccines in cell culture.